Ali economy almost all members, more than 200 Tianmao brands and more than 200 enterprises Blue V have come up with an incredible surprise package.The gift package is divided into two parts: the virtual resource and the real prize.According to incomplete statistics, the total bonus is estimated to be over 100 million. After the message was sent, the micro-blog was quickly forwarded.The number of repeater in 1 hours exceeded 200 thousand. By the end of the release, the forwarding was over 2 million. 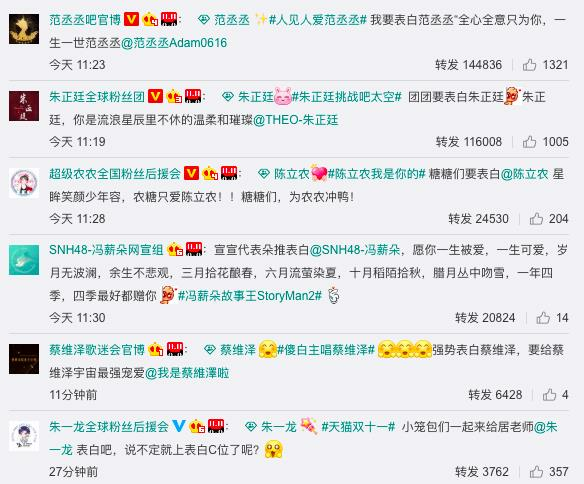 Before this, Tmall 618 planned the "son of heaven election", and the activities of "Chinese Koi" planned by Alipay during the national day plan, all of which have achieved an amazing amount of forwarding. Among them, "Chinese Koi" has reached a record of 6 hours and 1 million forwarding. 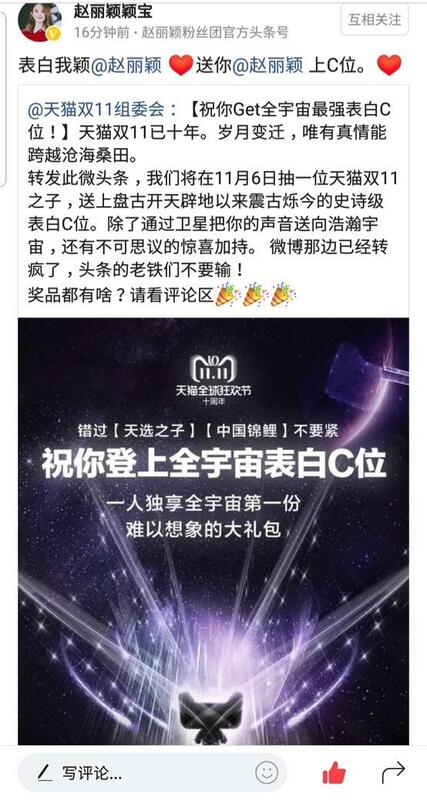 Tianmao's "Universe C Place" lottery, launched today on the microblog and today's headline platform, not only attracted netizens to participate, but also the entertainment industry's strongest traffic stars Zhao Liying, TFboys fan support groups have participated, once again created a surprise for netizens. In 2018, Tianmao Shuang11 entered its tenth year. In the past ten years, Internet ecology and business festivals have experienced different iterations. From the first double 11 of 27 brands in 2009 to 180,000 brands in 2018, Tianmao not only created a new commercial miracle, but also wrote a play textbook by hand every year through different ways of playing. 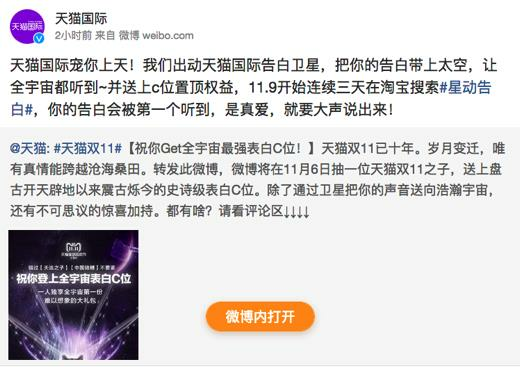 So far, Tianmao Shuang11 has been expanding the economic boundaries of the Internet era. Unlike other sales platforms, Tianmao Shuang11 has become the Olympic Games of global commerce. 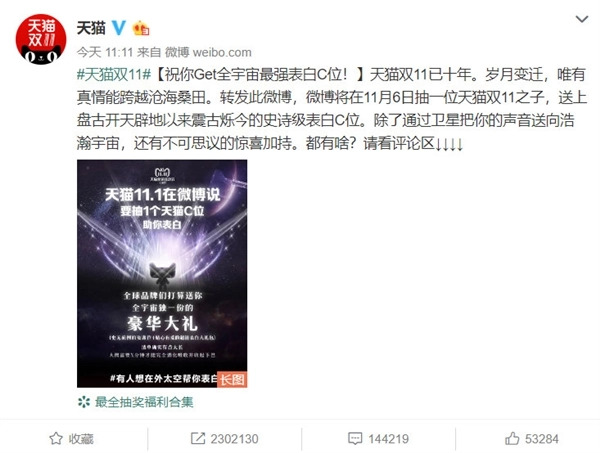 Six days before the opening of the prize on Nov. 6, the Organizing Committee of Tianmao Shuang11 is constantly adding materials to predict that Tianmao Shuang11 will create a new business miracle and add a new case of surpassing Shuang11.